Full Moon blessings to all! Today is the first of two Full Moons this month (welcome to March, by the way), this one being in the sign of Virgo. Considering that Full Moons themselves represent cycles, culminations, and especially letting go, this seems to be the perfect card for this time. Our actions and choices have consequences, and the blame can not be placed upon another, rather, it lies within our ability to choose and understand cause and effect. In some ways, I feel as though this could go both ways today. 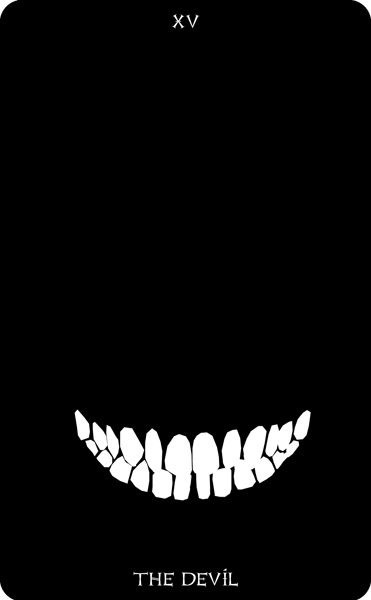 Full Moons can cause us to succumb to the temptations we struggle with in life, whether it be drugs, alcohol, food, gambling, or technological devices. But, we also have the ability right now to let go and break free, and something tells me that the events happening now represent that for each of you, what you are breaking free from, and consequently moving on, and moving forward, in the next few months. Very often in life, we feel trapped by our circumstances, but the Devil card reminds us that we do indeed have free will, and the power to change our lives and set ourselves free. This entry was posted in Artist, Deck Review, Featured Card of the Day, General Tarot, Readings and tagged Card of the Day, Devil, Guidance, Path, Reading, Tarot. The Empress card is a very powerful one. 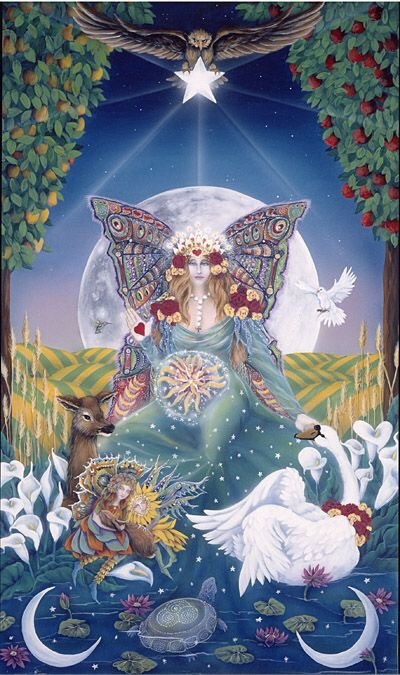 She is the Divine Feminine, Mother Nature at her finest, representative of fertility. I can’t help but feel that quite a few of you out there will hear of a baby, or even a pregnancy, at this time. This is not a meaning I always consider, but today I am. Today, we end eclipse season, and life itself is getting ready to give birth to a new phase. 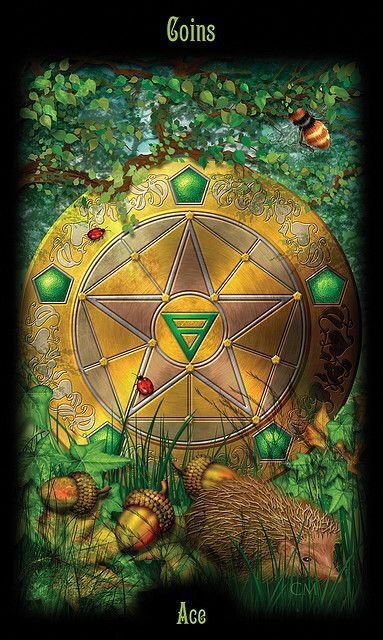 There is a special form of abundance here, and after yesterday’s Ace of Pentacles, it could very well be you see it in some form in your corner of the world. New ideas can be had now, as well as seeing success with current projects coming to fruition. The Page of Wands is a fire card representing exploration, discovery, enthusiasm & a free spirit. 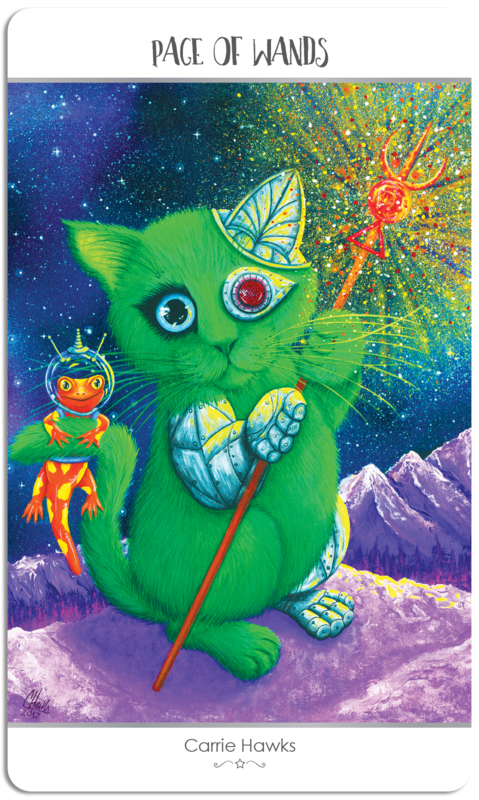 I decided to portray my Page of Wands as Cyborg Explorer Kitten “Cy” with his Space Salamander sidekick “Sal”! Cy & Sal are excited to explore this unknown purple planet with its three mountains & distant star filled galaxies. The red feather of accomplishment from the traditional card is symbolized as part of Cy’s red cyborg eye. I brought the symbol of the tail chasing salamander from the traditional card to life by Sal riding on the Cy’s tail. The wand has many fire elements such as the moon glyph for fire, under that the fiery healing crystal Carnelian, and then the elemental symbol for Fire. Cy & Sal are enthusiastic space explorers with a passion for discovering their destiny! 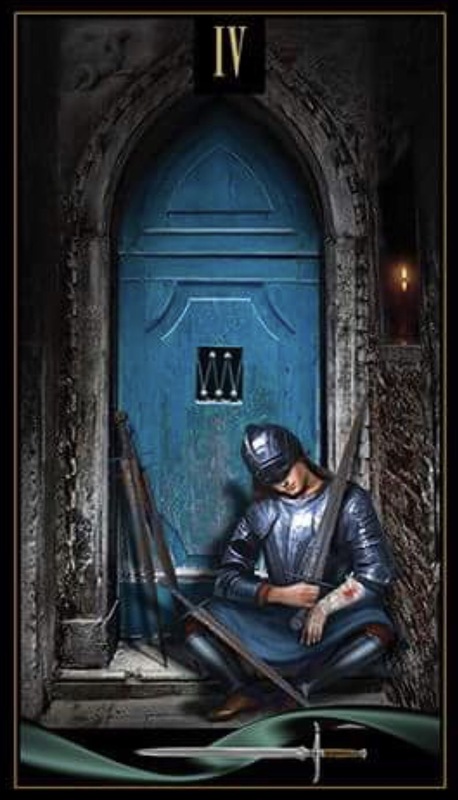 When this card appears in a reading, it is suggesting that this is a time to grab at life with both hands and see where spontaneity and passion can lead you. Go on a journey of discovery – take a chance, be impulsive and play outside the rules for a change! Have some fun, be spontaneous, indulge in your passions and creativity – tackle a new challenge, or try a novel approach with an older issue. If only for a short while, try to ignore your daily cares and worries, the stresses and doubts that come with day to day life, and have some fun! This entry was posted in Artist, Deck Review, Featured Card of the Day, General Tarot, Readings and tagged 78 Tarot, Astral, Page of Wands, Tarot. I am honored to have received the Chariot, and how serendipitous! 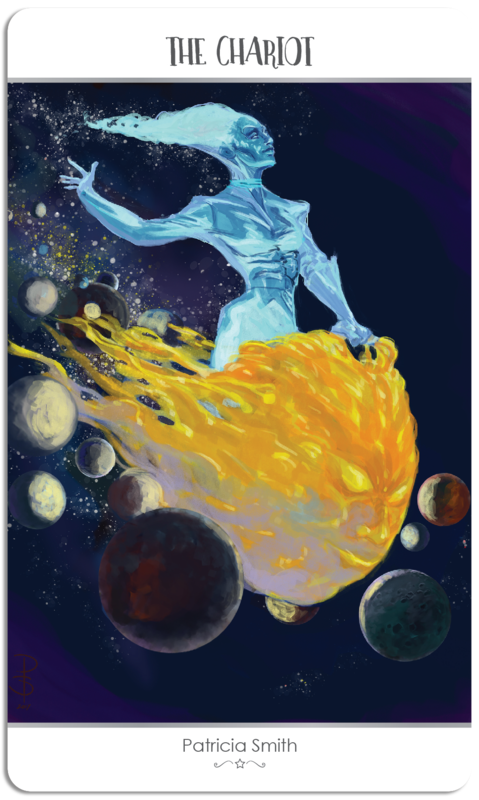 Since beginning work on this tarot I’ve made some humongous life altering decisions. I’ve moved out of my beloved Pacific Northwest, where I’ve lived all my life, to Los Angeles. I came to the conclusion I needed to move in January. Made the move in February. Along with a career change. I came here, with the objective to become a sketch and storyboard artist. I drove here with nothing but whatever I could fit in my car. I’m rebuilding my life; re-inventing myself. From scratch. I’ve been SO TESTED, but my resolve has never faltered. I have remained: determined, focused and disciplined on my objective. This is going to happen. It’s why I’m here and not going back. The Chariot is me and I am The Chariot. A flaming chariot hurtles through the cosmos. There is no need for animals of burden to pull this vehicle, it is propelled through space by sheer force of will, the charioteer’s hand aloft in determined self-assurance. This is a heavily populated universe, planets close enough to seem almost like a meteor belt, but his control and confidence are absolute, leaving all the planets safe and intact in his wake. When this card appears in a reading, it is advising you that your success is assured, as long as you keep a firm hold of the reins. Be bold and daring, but don’t lose focus and let it all slip away… This is a time to work hard and keep your momentum and energy flowing, even when there are obstacles in your way. They can be easily overcome – success is right within your grasp. This entry was posted in Artist, Deck Review, Featured Card of the Day, General Tarot, Readings and tagged 78 Tarot, Astral, Chariot, Tarot.